Mark Thomas Valley (born December 24, 1964) is an American film and television actor, best known for his roles as Brad Chase on the TV drama Boston Legal, Oliver Richard on the NBC drama Harry's Law, FBI Special Agent John Scott on Fringe, Christopher Chance in the Fox's action drama Human Target, and Tommy Sullivan in ABC's Body of Proof. Valley was born in Ogdensburg, New York, and graduated from the United States Military Academy in 1987 with a Bachelor of Science degree in mathematics and engineering. He served in Berlin, where he played rugby for the U.S. military team, The Berlin Yanks Rugby Football Club. He served in the military during the Gulf War. Valley obtained his first role, on The Innocent (1993), while serving in the U.S. Army in Germany. He landed the role of "Father Pete" on Another World in 1993. He later took over the role of Jack Deveraux on the NBC Daytime soap opera Days of Our Lives from 1994–97. In 2003, Valley played Detective Eddie Arlette, an American police officer in London, on the short-lived Keen Eddie. He played Brad Chase on Boston Legal, a spinoff of the television series The Practice. Valley also appeared on the television series ER as Richard Lockhart, Abby Lockhart's ex-husband. In 2008 he appeared on Fringe, as FBI agent John Scott. Valley played the lead in Fox's drama Human Target. In 2012, Valley joined ABC's Body of Proof as a series regular. He played Det. Tommy Sullivan, Dana Delany's love interest. He also co-starred alongside Delany in her short-lived series Pasadena in 2001. He has a daughter, Sherri, born in 1987. He married Anna Torv, his Fringe co-star, in December 2008. They separated after one year of marriage. Valley appeared on Ken Reid's TV Guidance Counselor podcast on September 14, 2016. ^ a b Rochlin, Margy. "The Man Without the Prosthetic Nose", The New York Times, January 10, 2010. ^ Andreeva, Nellie (July 28, 2012). 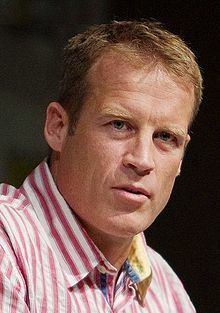 "Mark Valley To Join 'Body Of Proof' As New Regular". Deadline Hollywood. Retrieved July 29, 2012. ^ Jay Bobbin (February 19, 2013). "'Body of Proof': Dana Delany reunites with Mark Valley for Season 3". Zap2it. Archived from the original on March 28, 2013. Retrieved March 31, 2013. ^ Dos Santos, Kristin. "Anna Torv and Mark Valley Married!" E! Online, February 2, 2009. ^ "Anna Torv and Mark Valley Split"
Wikimedia Commons has media related to Mark Valley.